When Shelby’s grandmother had a reaction to one of her medications, resulting in her being admitted to hospital, Shelby wanted to do whatever she could to help her grandma feel more comfortable. 21-year-old Shelby Hennick, a veterinary technician from Santa Maria, California, was devastated to find that her grandmother had almost been left paralysed due to a reaction to her medications. Shelby is very close with her grandma, especially as they only live 20 minutes apart – so she visits often. But Shelby doesn’t just visit her grandma – she heads over to see her grandma’s dog, Patsy, too. Shelby’s grandma absolutely adores Patsy, who she’s looked after for for thirteen years. Shelby explained: ‘She got her dog, Patsy, when she was only a couple weeks old, she had to be bottle fed and fit in the palm of her hand. 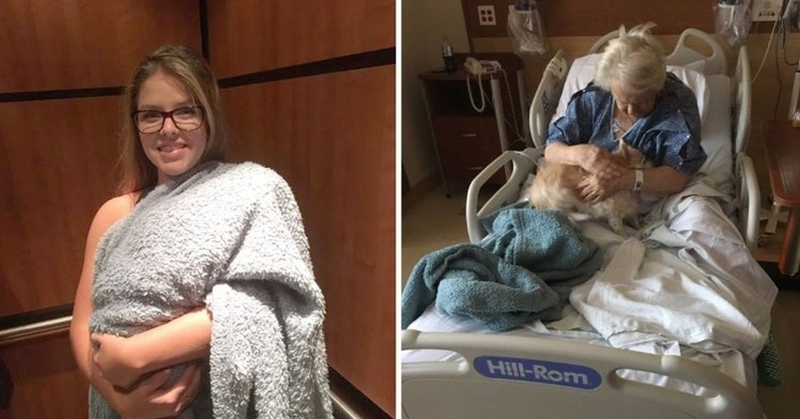 After her grandmother’s hospital stay reached three days, Shelby knew that she must be missing Patsy like crazy – and so she decided to pull off the most amazing surprise to keep her going – by ‘dog-napping’ Patsy to take her into the hospital to see her doting owner. Of course, animals aren’t meant to be in the hospital, and so Shelby smuggled her in, wrapped up in a blanket so that nobody could see. ‘It was actually my moms idea to dog-nap Patsy, I just happen to be passing her house when she called so of course I was gonna do it,’ Shelby told us. ‘Nothing was planned, I just by chance had a blanket in my car, swaddled her up and just walked in! Luckily we’ve been in the hospital enough lately that they remembered who we were so we just walked by and waved to them! She added: ‘My sister had a baby about a year ago so I think my grandma thought it was him because when I walked in she went “Ohh you brought the baby” and then I put Patsy down on her lap and she was so surprised! Patsy kept crying and couldn’t get close enough.